I used to make a physical copy of all the audio CDs I buy to CD-R. Then I’d only listen to the CD-R, in fear of breaking my original discs. Maybe you think this is madness, but I do own CDs that I’ve been listening to every month since 1989. I don’t want them to break, since they are irreplaceable. Sure, newer versions of the same albums sometimes exist, but they are usually mastered in a very bad way to turn up the loudness to all hell, so all detail that was present in the music is gone. The original CDs from the 80s and early 90s don’t have this problem, they offer much more fidelity. If you’re interested in this crazy loudness competition between studios, it’s sometimes called the Loudness Wars. But to make the long story short: Copying to CD-R is stupid and annoying, and lossless compressed formats such as FLAC have arrived. Also, terabytes of disk space are cheap. So now I can rip the CD to FLAC and stick it on my RAID NAS, which I backup from time to time. If I ever need a physical CD copy of the music, to play on my reasonable-quality CD player, for example, I can just burn from those FLAC files as they contain pristine versions of the audio. 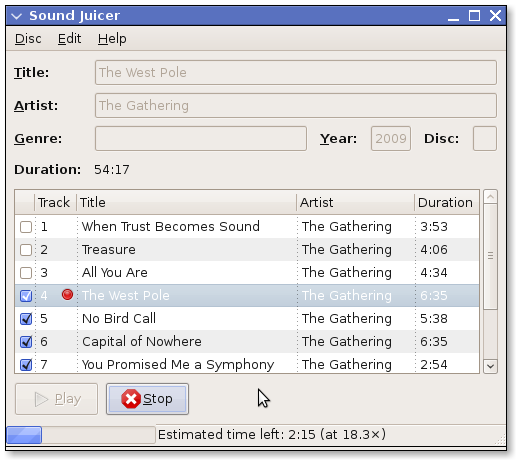 If you use a proper audio player, you can also listen to FLAC files directly on the go, and of course on your computer or network audio player. In case you need to save space or don’t need the quality, you can encode the FLAC to Ogg or MP3 and listen to that copy on the road. All much easier than with CD-R copies! One click, and it rips, encodes and copies to my NAS for safekeeping. I still have to buy the original disc and have it shipped to me, but that’s okay, I like to have a physical thing from a band in my hands, something I can hide in my sad and sunless CD archive to preserve things until the fall of mankind. Back in March, I went to Megadeth’s concert in Zürich. Megadeth were my childhood heroes during their Rust in Peace era, and I still consider RIP one of thrash metal’s best albums. It was a surprising gig for me. I’d never seen Megadeth live before, and the Megadeth at the (hopelessly overcrowded) Rohstofflager wasn’t the same as the band I used to know. None of the RIP-era members except Dave are still in the band, and Dave Mustaine is what keeps it all together. No offense neant, but the others just seem like remote-controlled robots. They did play some of my favorites, like Tornado of Souls and Hangar 18, but the show was really hampered by the awful sound. I’ve heard people complain about the Rohstofflager’s horrible equipment before, but I hadn’t expected this. The guitars were muffled, the room was way too small for the drums and Dave’s vocals disappeared completely every few seconds. Not such a happy event. Then there’s the fact of Megadave. His crazy red hair makes him look younger, but there’s still something eerie about seeing how old the people seem that in your mind are never older than 22. It’s not that he has no energy, but he’s just not the Dave that fits in a thrash metal band anymore, at least to me. What a weird evening. I’d been offered 200 Francs for my ticket, twice, before even getting to the venue. I think I should’ve sold it. 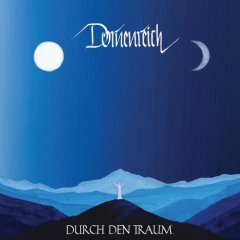 Dornenreich‘s Durch den Traum ("through the dream") took my breath away. It is a dark amalgamation of all that is Dornenreich. It takes the powerful grief and despair from Her von welken Nächten and sharpens it to a fine, pricking point. Then it adds the lazy melancholy, the slow sorrow found on Hexenwind, smashes both into tiny bits and mashes it all together again. Plus, there’s traditional black metal elements that you’ve known since (at least) Burzum. Who could resist? The emotions in these sounds are silvery, fleeting and foglike, they once taste moist like the moss of the forest but at the next lick bitter as chalk. The reverberating electric guitars run shivers up your spine, then die off abruptly to let the whispered lyrics chase the shivers back down again. Often these soundscapes are evoked at the same time, in layers one above the other. At other times one flowing into the next. Acoustic guitars here, electric ones there, but never clashing, always complementing each other in their dissonance or trivially harmonizing. It’s all masterfully woven and arranged, no sound dares to be heard at the wrong time, no whisper or scream has an unfitting intonation and yet the whole construction is lightweight, does not feel artificial or unwieldy, creates pressure only when pressure was meant. Agalloch's Ashes Against the Grain: Superb! If you don’t know Agalloch, they make a sort of lightweight black metal with strong doom and some folk influence. Their last two albums were already quite convincing, but I think with Ashes Against the Grain, Agalloch have truly found their legs. There is an all-permeating wailing melancholy that is expertly woven into all the tracks, yet never overpowers. That doesn’t mean the songs have no force. Some small, sad melodies of five or six notes still have the power of entire arias, as heard during Our Fortress is Burning, and there are enough heavy, pounding riffs all around. A very good mix. The musical evolution from the last album is not **that** pronounced. Still, the songwriting seems more confident, compact and reflected. You truly get the feeling that this time, the band knows exactly where it’s heading. Where earlier albums sometimes left you bored, the new tracks are very unpredictable. Every time you get used to a certain repeating melody, the song changes or interesting new elements are introduced. This works wonders against any boredom. The folk elements, by the way, were pushed back a bit to make way for more concentrated Black and Doom. The production is again excellent, perhaps a bit clearer than on Pale Folklore. Author Psy-QPosted on August 6, 2006 Categories MusicLeave a comment on Agalloch's Ashes Against the Grain: Superb!